This bench is beautiful at my new home. Add a touch of beauty to your garden, mudroom or outdoor living space with this alluring Highland garden bench by International Caravan Home Furnishings. The subtle stain finish gives this bench a touch of vintage charm, while the simple design blends well with virtually any decor. Constructed of solid Acacia hardwood, the Highland bench is durable and meant for use both indoors and outdoors. So, sit back to a nice cup of lemonade and relax outdoors with or without company with this new contemporary 2-seater bench by International Caravan Home Furnishings. Dimensions 45.0 In. X 5.0 In. X 25.0 In. The perfect find for me. I was looking for a bench to match a trellis arch and this bench is perfect. The lines are similar and the stain is exact. Don't know what the longevity will be outside at this point but Acacia wood is plantation grown and weather resistant. 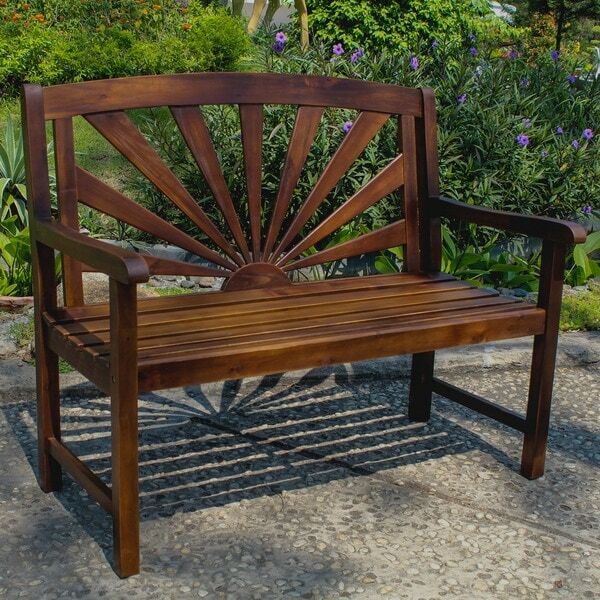 It is solid, comfortable, and a different design than the standard garden benches available. The bench is not particularly high quality; the finish is not very even and the stain is slightly darker than pictured. Be careful tightening the screws or the wood cracks. Mine had a little bit of damage from the shipping, however fortunately it was located where it would not be seen easily. I wouldn't leave this out in the weather. For a decorative bench, it is fine. Looks fantastic - afraid to sit on it though! I bought this bench to put in my covered front porch. The bench looks fantastic but kind of flimsy. Its not in an area where people will sit on it often though so I think it will serve its purpose (to look nice) wonderfully. Also its not exposed to any weather - I think that if this bench was out in the sun and rain for a few weeks it might have some trouble. If you are looking for an attractive piece that is used more to fill a space than as a place to sit everyday - this bench is perfect! Also - it was very easy to assemble - but the wood is so soft you need to be careful we you are screwing the pieces in not to let it cruch the wood. Love the back on this bench -Fits in well with Southwest decor. Nice wood, went together easily - everything needed for assembly is supplied. As usual, Overstock delivery is prompt and product arrived in perfect shape! I had ordered the Sapporo chair and sunburst table earlier this year and was so pleased with them that I thought I would get the bench as well. It was easy for me to put together by myself and is very sturdy. Like the chair, the bench seat needs some sort of cushion to make it a bit more comfortable, so I am using a folded serape. I have a lovely little outdoor seating area now that I am confident will last for years. This bench was very easy to put together with one person. Using two people would be quicker but very simple. You need no tools, the wrench comes with it. It has good weight to it. Weight limit for use is 300lbs so not good for 2 heavy people to sit on. Purchased this bench to go with Sapporo chairs and side table. The sunburst back design attracted me. Acacia wood is new to me. Will treat like teak. Appears to be sturdy. Using in an outside entrance way. I have added a bench cushion for comfort. Very attractive and have received compliments. I received this as a gift. They sent a wrong part. When it was put together, you could tell it wasn't strong enough to sit on. Sure enough, come cold weather, it cracked. It isn't worth the money! Excellent product. Took me 10 minutes to put together and it appears that it us very sturdy. You would never know that I assembled it. It arrived in no time. The only problem I had was that the picture did not match the product. I think the picture is much nicer. However, I think the price was a steal for the quality so I didn't even complain. I love the design and it was delivered on the date they promised. I am terribly disappointed in that the color is not at all like the picture but instead a dark mahogany almost black walnut color. There was one misplaced drilled bolt hole that luckily doesn't show from the front. One other bolt hole wasn't deep enough and we had to drill it deeper to assemble the bench. beautiful bench, comfortable and just the right size for my garden. BUT, it took 3 men an hour to put it together. the holes for the screws were not lined up correctly. I ended up spending quite a bit of money to pay people to glue it. This is a beautiful bench! Well worth the money! i liked that the back of the bench had a southwestern look to it. my husband, who puts things together for me and never complains, said it was pretty easy to put together and was made well. price was also nice. Perfect for our front porch! Product was exactly as advertised. The wood color is beautiful, and it is easy to assemble; however, as soon as we put the bench together and as it was still in the dinning room; where I had room to spread the parts; I sat in it and heard a loud crack. Guess what? The middle bracket support broke in half. What a disappointment.... Returned!!!! We have had 2 of these benches for 10 seasons now. I absolutely love the sunburst pattern. These are in our covered screened in porch so they are not out in the harsh weather elements, The chairs we bought that matched were not and have been falling apart the last couple of years. I would suggest treating them to preserve them. The specs don’t include a wright limit. My husband at 230 lbs sat on it and it crunched. This bench was made for looks at not use. Reduculiously light weight. Beautiful bench - love the wood. "Does this bench require assembly?" Thank you for shopping with us neeliec. Yes the bench needs to be assembled. Have a great day. "Can this remain outdoors during Midwest winters?" Hello crittermom2014, yes you can leave this out in the winter. Have a great day! "In regards to the answer about the dimensions of this bench . . . are you sure? How could the bench be only 23"
The size of the bench is okay for me. Hello captobv! I really this bench! I have confirmed that the dimensions for this bench are 43 inches wide x 35 inches deep x 23 inches high. I hope this helps. thanks for shopping with us. "Are the dimensions on this bench correct? It seems awfully deep. could the height and depth be mixed up? Thanks,"